Updating Apple's software on your Mac is an important maintenance task that you should perform regularly. Using the latest versions of Mac OS X and Apple's applications can protect your Mac against malicious attacks, improve sluggish system performance, and fix bugs that can cause applications to randomly crash. This tutorial will show you how to automatically and manually update the Apple software on your computer. Click Software Update. The window shown below appears. Select the Check for updates checkbox. From the Check for updates menu, select a time interval, such as daily or weekly. Optional: Select the Download updates automatically checkbox to automatically download all available updates in the background. You might not want to select this option if your internet service provider limits your bandwidth consumption. You've successfully configured your Mac to automatically check for and download system software updates. Unlike other operating systems, Mac OS X will never install system and application updates without your authorization. (The one exception to this is the security definition updates described in the next section - if you have that option enabled.) To actually update the system software and Apple application, you have to press the Install button yourself. 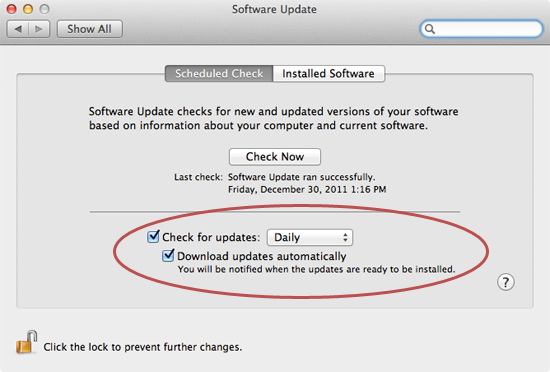 If Software Update is set to automatically check for updates, the window shown below appears when updates are available. Click Continue to download and install the software updates. You can also click the Show Details button to view the available updates and select the ones you want to install. 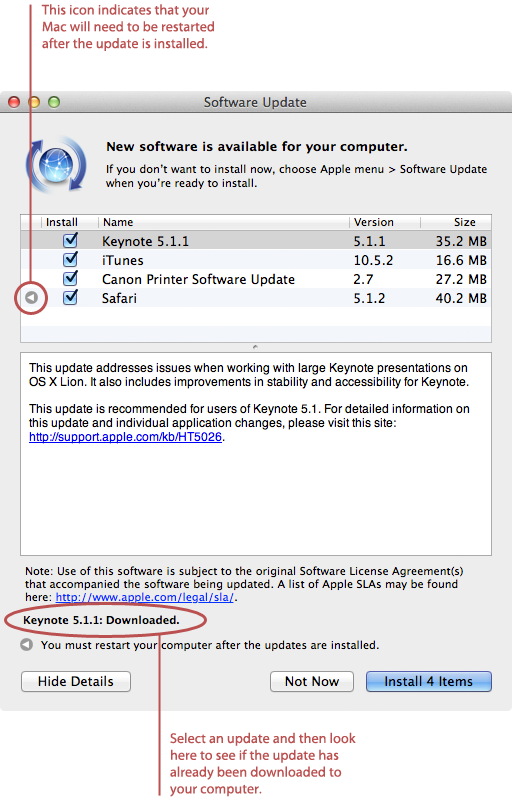 To manually check for software updates, select Software Update from the Apple menu. The window below appears. Your Mac connects to Apple's servers and searches for new software. If new software updates are available, the window below appears. Quit all running applications, connect your laptop to a power source, unplug unnecessary devices from your Mac (such as printers or USB hubs), and then click Install Items. Software Update downloads and installs your new software. Depending on how many updates you're installing, this process could take a while. You may need to restart your Mac after the updates have been installed. That's it! You're Mac's system software and Apple applications are up to date. Select Security & Privacy. The window shown below appears. Click the lock icon and authenticate with an administrator username and password. 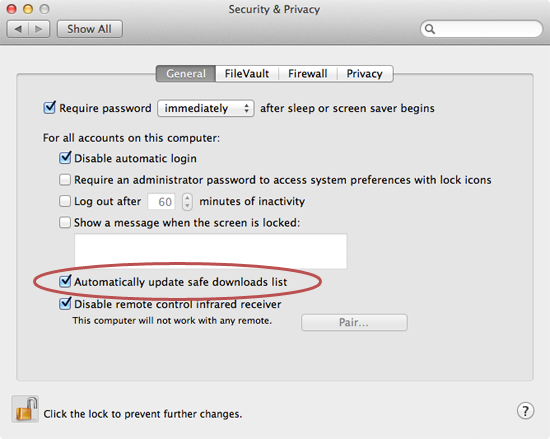 Verify that the Automatically update safe downloads list checkbox is selected. Now your Mac will automatically download updates to patch vulnerabilities and remove malware. Matthew Cone, the author of Master Your Mac and a freelance writer specializing in Apple hardware and software, has been a Mac user for over 20 years. A former ghost writer for some of Apple's most notable instructors, Cone founded Macinstruct in 1999, a site with OS X tutorials that boasts hundreds of thousands of unique visitors per month. You can email him at: matt@macinstruct.com.